Last summer this skunk ambled along near houses, across porches, and into garages on its evening rounds in downtown Westborough. It should be back this month when it comes out to look for a mate. Mid-February seems the dead of winter, especially with the recent frigid temperatures, but the natural world is waking up once again. There's a certain something in the air – the smell of skunk. It's a clue that mating season has arrived for skunks and many other wild animals. Striped skunks (Mephitis mephitis) hole up in underground dens for the winter, sleeping through cold spells but not actually hibernating. They awaken in mid-February and emerge for the mating season. 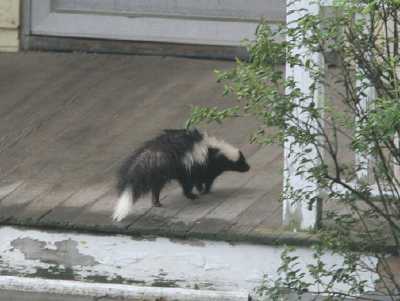 If a skunk has to defend itself, we'll notice its odor in the air, and hopefully not on our inquisitive pets. Male and female skunks spend the winter in separate burrows, so they need to come out to find one another. Females often stay together in the winter, with perhaps up to six in one den. Males, in contrast, remain solitary in their winter dens. Skunks move into abandoned woodchuck or fox burrows or dig their own. Sometimes, much to our dismay, they find a cozy place under a building or porch. Everyone knows that skunks defend themselves with their foul-smelling spray, but what else do we know about them? For example, they're great diggers. They have long, sturdy claws on their front feet. The burrows that they dig can have as many as five entrances and three chambers. Skunks will eat just about anything, including garbage, carrion, wild fruits, nuts, and seeds, but insects make up a large part of their diet, at times up to 70 percent. Their front claws are handy for digging up grubs – one of their favorites – and earthworms. They also dig out and eat small rodents, such as mice, voles, shrews, chipmunks, and moles. It's even been said that skunks are good to have around because they help to control insect and rodent populations. Skunks are a common sight in Westborough, from downtown neighborhoods to large developments to our remaining farms and conservation land. They live in places that have water – because water breeds insects – and Westborough is such a place, with its five swamps, two rivers, and many ponds and streams. Because skunks adapt well to developed areas, the increasingly suburban character of our town isn't going to discourage them. When are you most likely to see a skunk? They're active at night, but during mating season they sometimes come out in the daytime. Your chances of seeing a skunk are best around dusk or dawn, perhaps during an evening constitutional or early-morning jog. When this year's young are old enough to leave their den, perhaps in June, you might catch sight of a skunk family, with 4 to 6 youngsters following in a line behind their mother. Male skunks play no part in rearing the young. What happens if you meet a skunk – up close and personal? One evening you might walk around the corner of a building or a bend in the trail, and surprise! The furry black and white kitty in front of you turns out to be a skunk. Don't get close. Skunks are shy but seem fearless, since they are used to being avoided. If they hear you coming, they'll get out of your way, as most wild animals do. But they tend to stand their ground in a close encounter. When a skunk feels threatened, it usually does a little dance, stomping its feet, rearing up, and clacking its teeth or hissing, before it gets ready to spray. Needless to say, this display is your warning to back off. If the skunk turns around and raises its tail, you know it's getting ready to spray. A skunk can spray a stream or a mist from the two musk glands at the base of its tail. Its aim is quite accurate. The foul-smelling spray can reach 10 or 15 feet. The odor comes from sulfur-containing chemicals. The musk glands hold about a tablespoon of fluid, which is enough for the skunk to spray 5 or 6 times. After that it takes a week or so to replenish the supply. Skunks as young as 8 days can spray, even before their eyes open. Skunks are native to our area and were well known to the native Americans. The name skunk comes to us from the Abenaki of Maine, who had a word meaning "one who squirts." European settlers also sometimes used the name "polecat" after a weasel-like European animal. Skunk spray does not transmit rabies. That's fortunate, because skunks get the same strain of rabies that infects our raccoons. Skunks get it from eating carrion from an infected animal, or from one another. Rabies is transmitted by saliva, so an infected skunk can pass the disease to others when skunks spend the winter together in a den, or during the mating season. Thanks to their smelly chemical defenses, skunks have few predators. Great horned owls (Bubo virginianis) are one. These large owls hunt at night when skunks are on the prowl. They have keen eyesight and hearing, but little sense of smell, so skunk spray doesn't bother them. Red-tailed hawks (Buteo jamaicensis) hunt during the day and sometimes swoop down to capture an unsuspecting skunk that's out then. Hungry foxes and coyotes also occasionally take skunks. All these predators have their own mating seasons around now. How can you keep skunks out of your yard? The main thing is not to attract them with food. Don't feed pets outside, where leftover food can tempt skunks and other wildlife. Clean up areas around bird feeders, and keep garbage cans securely closed. If a skunks digs for insects in your lawn, try spreading moth balls to keep it away. But when you smell skunk this month, smile – it means that spring is right around the corner.